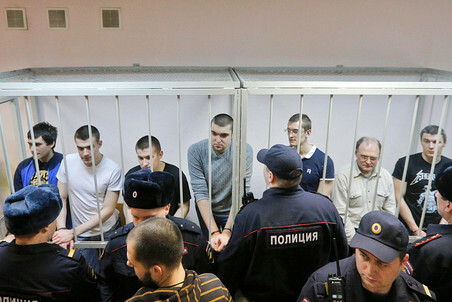 In the midst of the closing ceremonies of the Sochi Winter Olympics, and the crisis in Ukraine which has now toppled the Yanukovych government, a Russian court handed down sentences to the defendants in the Bolotnaya protest trial who had been found guilty last week. The result comes as no surprise to defence lawyer, Sergei Panchenko, who views the decision as being made by the government, not the court. Below is a Gazeta.ru timeline of the proceedings. — Ed. On Monday at 10:30, the reading of the sentences of the defendants in the “6 May Trial” continued. The court had already pronounced eight of the defendants guilty of participation in mass riots and the use of force against government representatives. The prosecution asked to give sentences to the defendants of imprisonment of up to 5 to 6 years. 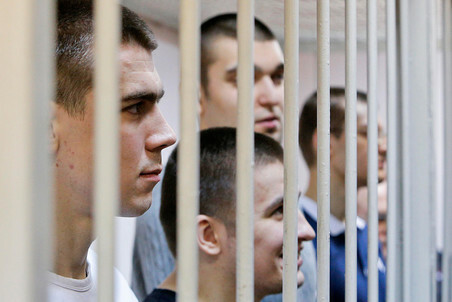 Defendants of the “prisoners of Bolotnaya” gathered outside the courtroom. 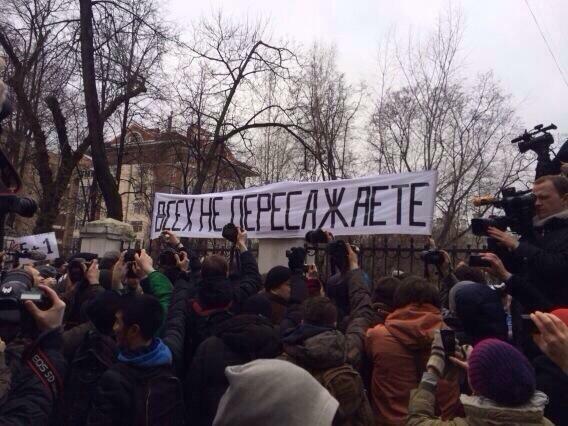 Gazeta.ru broadcast the events life. Court session closed. We are coming to our senses. Aleksandr Naumovaya (Dukhanina) – 3 years, 3 months suspended for period of three years. Artyom Savelov – 2 years, 7 months standard-regimen; the sentence is to be calculated from 11 June 2012. Aleksei Polikhovich – 3 years, 6 months standard-regimen; the sentence is to be calculated from 26 July 2012. Denis Lutskevich – 3 years, 6 months standard-regimen, starting 9 June 2012. Sergei Krivov – 4 years standard-regimen; calculate from 18 October 2012. Stepan Zimin – 3.5 years of standard-regimen colony from 8 June 2012. Yaroslav Belousov – combined 2 years, 6 months standard regimen. The sentence is to be calculated from 9 June 2012. Pronounce Andrei Barabanov guilty on both counts with punishment of 3 years, 7 months standard regime. The sentence is to be calculated from 28 May 2012. The fact that Krivov has children was also taken into account as a mitigating circumstance, but his disabled mother was not taken into account due to the absence of documents. Moved on to Lutskevich. Yaroslav Belousov is characterized positively, the fact of a child is a mitigating circumstance. Moved on to Dukhanina (Naumova), Zimin. All of them characterized positively. OVD-Info reports 148 detained [outside courtroom]. It seems the reading out of the sentences is ending. Everyone is getting reading and has tensed up. Well, naturally, no one had any doubt. The OMON [riot police] are organizing a “corridor” and separating the crowd. Rough detentions are continuing, but so far no clubs have been used. 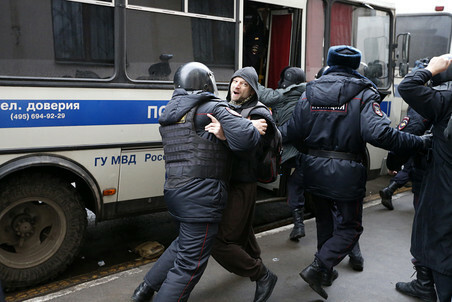 They tried to detain Nadezhda Tolokonnikova, but the crowd wrested her away.